A lot is being talked about Online Grocery Store Business in India and I see lots of Full Page Advertisements in newspapers of Mumbai. But I always see those advertisements differently due to my personal experience with Online Grocery Store business. In year 2010-11, I started working on Online Grocery Store (OnGoShop.com) business concept and invested good amount of money and time of six months but than I decided to pull off and wrote off my investments and efforts. Today I feel happy that I didn’t invested further. No wonder when I see these advertisement, I see the desperation to recruit consumers and build revenue in all the discounts and annual offers etc. 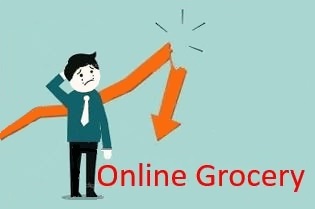 In current hyped e-commerce environment Online Grocery Store might sound as good option, but as per me, pretty soon tiring effect will settle in and current Online Grocery companies will struggle to keep themselves floating and to get next level of funding. Logistic, Delivery Time and Quality Control are the biggest problems in these online grocery ventures. It’s hard to compete with next door Kirana Shop on these three points. Next door Mom & Pop Stores anyways offer convenience and delivers on a telephone call and there are no hazel of payments/ credit card or minimum order value. Many Kirana Shops even offer credit facility too. Per consumer transaction cost is too low to yields profits to online grocery stores. So till the time, one can pump in money in terms of marketing efforts (advertising, discounts and offers), consumers may get attracted and shop online but they won’t take long to get switch off when offers dries up. In big towns monthly grocery shopping in Shopping Mall is a big family outing occasion, hence this may be one more reason which keeps consumers away from online grocery stores and goes against such companies. To conclude – may be in bigger towns Online Grocery Companies may find thin numbers of consumers but I don’t see this segment gaining momentum in next 3-5 years. In such case companies who have continual funding, they might find some headway but I am not too sure even of that.